Download all progressions & table tent cards here. #LL2LU SMP-1: I can make sense of problems and persevere in solving them. #LL2LU SMP-2: I can reason abstractly and quantitatively. #LL2LU SMP-3: I can construct a viable argument and critique the reasoning of others. #LL2LU SMP-4: I can model with mathematics. Work in progress…Coming soon…we hope! #LL2LU SMP-5: I can use appropriate tools strategically. #LL2LU SMP-6: I can attend to precision. I can attend to precision as I construct a viable argument and as I critique the reasoning of others. I can attend to precision. I can communicate my reasoning using proper mathematical vocabulary and symbols, and I can express my solution with units. I can write in complete mathematical sentences using equality and inequality signs appropriately and consistently. I can distinguish between necessary and sufficient language for definitions, conjectures, and conclusions. #LL2LU SMP-7: I can look for and make use of structure. #LL2LU SMP-8: I can look for and express regularity in repeated reasoning. #LL2LU SMPs from Jill Gough and Jennifer Wilson are licensed under a Creative Commons Attribution-NonCommercial-ShareAlike 4.0 International License. 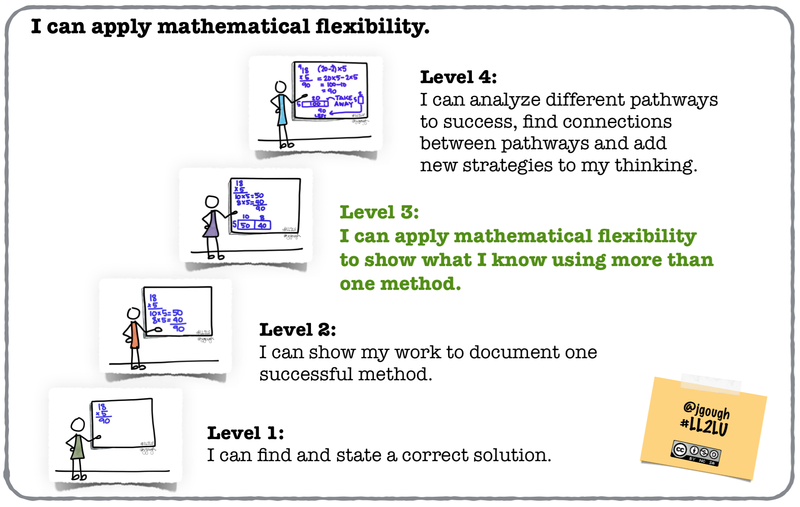 Mathematical Flexibility: I can apply mathematical flexibility to show what I know using more than one method. Show Your Work: I can describe or illustrate how I arrived at a solution in a way that the reader understands without talking to me. TEKS-F: I can analyze mathematical relationships to connect and communicate mathematical ideas. Thank you for creating and sharing these! Sure! Jill and I are glad they are helpful for others, too, since they have been helpful for our students’ and our own understanding of using the practices. These are awesome. Have you finished all of them?